Baja Construction has found an innovative way to create solar projects: incorporate solar panels into RV and boat storage facilities. Its most recent project is now generating solar power in the San Francisco area for PG&E. If all goes well, Baja Construction will be looking at a Phase II of the Oakley project. In the second phase, they plan to enter into a net-metering agreement with PG&E with the extra 70,000 square feet of roof space. While some projects take on a life of their own, rarely do you hear about an RV and boat storage project turning into a solar facility. But that's exactly what happened to Bob Hayworth, owner of California-based Baja Construction Inc.
About six years ago, Hayworth bought some land 40 miles northeast of San Francisco in Oakley, California, thinking he would put in metal-roofed RV and boat storage. "This was during the housing boom, and the City of Oakley wasn't excited about my project. They wanted me to do the drainage for the surrounding 90 acres, which was going to cost a couple million bucks. They also wanted me to bring in sewer, which would be another couple hundred thousand dollars." The project became financially prohibitive for Hayworth and stalled. After the crash in 2008, Hayworth went back to the city and suggested a twist on the project—solar RV and boat storage. Suddenly the city was very interested. This wasn't a novel idea for Baja Construction, which had built RV and mini-storage with solar roofs for others. The first project Baja Construction built was for Southern California Edison. "It was for the Santee Municipal Water District near San Diego, which has a recreation area," says Hayworth. "That was a huge success because they received the California State incentive, the federal tax credit, and the accelerated depreciation. The $7 million project ended up costing about $700,000, and they were producing $45,000 a month in rental income from the covered RVs." When Hayworth went in and pitched the solar idea to the City of Oakley, some of the required city infrastructure improvements were modified, thereby reducing the costs that had stalled the project in prior years. "They really wanted it—they wanted to be a solar city." Hayworth says they had a little luck there. "At the time we took in the one-line electrical drawing, PG&E had a program where they had a megawatt-and-a-half maximum for the small generator feed-in tariff program. After we got a reservation for the FIT, we worked our way through PG&E's interconnection process. Although we qualified for the Fast Track program, it took us over a year to satisfy PG&E's criteria and qualify the project for Fast Track. After reviewing and agreeing to PG&E's interconnection and upgrade costs (+/- 50 percent), we signed an Interconnection agreement with PG&E to build the solar facility at the site." 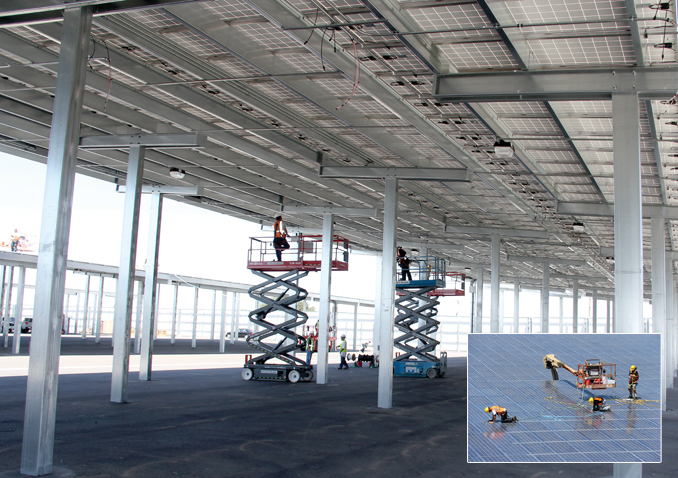 When it came to the choice of solar panels, Baja Construction left that up to Cenergy Power, the project's integrator. Cenergy's choice was S-Energy's high-efficiency 295 W solar modules. The project also included three Advanced Energy 500kW inverters. "After Hayworth executed the feed-in tariff with PG&E and safe harbored the 1603 grant with the U.S. Department of Treasury, he went looking for financing. At this point, things got a little tough when Hayworth found that banks were being cautious with their money. "We finally got a local bank to finance it, and we got the Small Business Administration to do the 504 business loan for existing businesses because I also own a self-storage facility," says Hayworth. "It was a lot of moving parts, and eventually it all came together." When it came to the solar panels, Hayworth left that up to Cenergy Power, the project's integrator. Cenergy's choice was S-Energy's high-efficiency 295 W solar modules. The project also included three Advanced Energy 500kW inverters. One of the benefits of this kind of installation, says Hayworth, is that because there is so much square footage, tracking modules weren't necessary. "On this project we had 179,000 square feet of roof area, and we're using maybe 100,000 square feet." Installation went smoothly, and the only hitch came in the form of a water drainage issue unique to this kind of project. "We can't allow water to go between the panels because we have vehicles underneath, and our customers get upset if dirty water flows over their vehicles." The solution was a tape with mastic on the bottom and foil on the top placed between panels. With everything sloped to the south, water will shed off the front of the carports like normal RV covers. Overall, Hayworth says it was an excellent team effort. "PG&E and the city were great to work with. They helped us with everything we asked for and needed, and if we had questions, they would help us through it." The grand opening of the facility was held in June. It's a great business model, adds Hayworth. "Within three years, they are expecting 100 percent return on their investment." Another benefit is that the RV and boat storage clientele (different from the standard self-storage facility) are a higher income demographic. "You're dealing with people who have money and have this possession that they cherish, and it's important to them that it is in a safe and secure environment. We are not only protecting their possessions, but my 1.5 MW solar facility." If all goes well, Hayworth is looking at a Phase II of the project. In this phase, they plan to enter into a net-metering agreement with PG&E with the extra 70,000 square feet of roof space. They will offset their onsite power consumption with more solar. "We'll produce enough power to support the facility itself," he says. This project was 1.5 MW, on over 10 acres. Baja's experience in building both RV and boat storage facilities and solar RV and boat storage facilities was instrumental in the development and construction of this project. During the last two years, Baja has built between 28 and 30 megawatts worth of projects. Headquartered in Martinez, California, about 20 miles west of Oakley, Baja designs and builds solar and non-solar projects all over the U.S. In fact, they have installations in 34 states. With over 25 years of experience building carports and steel structures, the move to combine solar panels with their storage facilities about six years ago was a normal evolution and another business model. "We have anywhere from 120 to 150 employees and offices in Long Island, Las Vegas, Phoenix, and two in California. We pretty much go wherever people want us," says Hayworth. 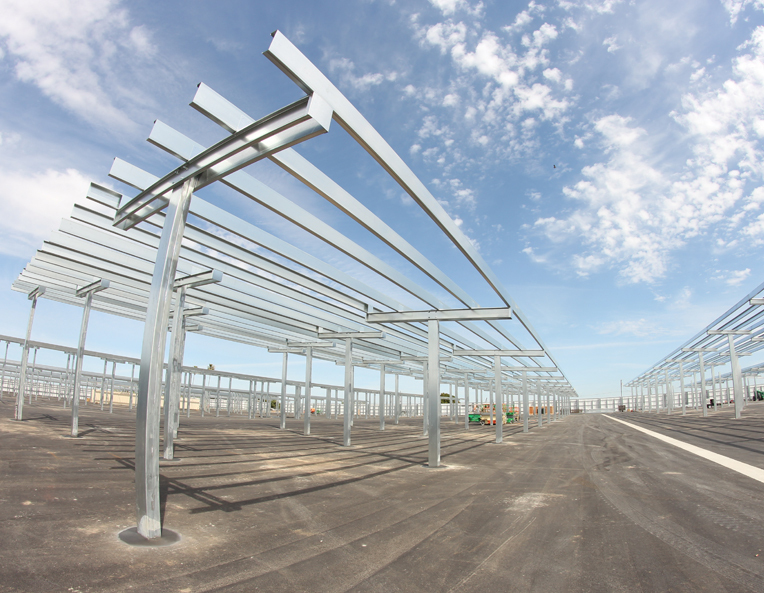 With over 25 years of experience building carports and steel structures, Baja Construction's move to combine solar panels with their storage facilities six years ago was a normal evolution and another business model. Baja is starting to get a lot of calls about solar storage, and Hayworth says he tells them that there are two criteria required to make it work. "You either need large energy usage such as climate controlled mini storage or some other big energy eater, or a feed-in tariff. If you have those two things and a medium demographic, this will work all day long." He adds, "If they have either fairly large energy usage for their site, like 250 kilowatts or more, or they've got a feed-in tariff that's more than 11 cents a watt, we can make that work as well." Hayworth is currently looking for another good feed-in tariff and a good location. "I'd like to personally do one of these a year. It's a winning model," he says. With Baja's success, Hayworth has been asked to speak on the topic at conventions and will be speaking at the next Inside Self-Storage World Expo in 2014. He is one of many who are beginning to see the potential in the solar/parking roof combo. A study done in 2010 by researchers at UC Berkeley found that there are as many as 800 million parking spaces in the U.S. Each space covers about 200 square feet, and many are exposed to the elements. An Internet news site, ReWire, reported that in California alone, there are an estimated 115 square miles of parking places. "At California's solar intensity, covering that area with PV could generate almost 1.5 terawatt-hours of electricity a day. That's significantly more than the state uses on even a high-demand day." No one imagines that solar/parking projects will ever reach these levels, but it does point out that there is plenty of room for growth and as Hayworth has experienced—plenty of revenue. Solar storage has definitely taken on a life of its own.